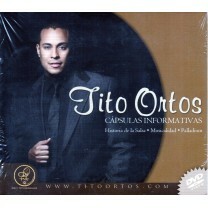 Tito Ortos	There are 7 products. Ortos J. Gutiérrez Ortiz, better known as Tito Ortos, was born in Santurce on December 26, 1974. 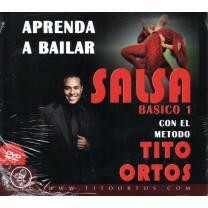 After finishing a Bachelor's Degree in Natural Science from the University of Puerto Rico and studying music, vocals, bass and clarinet, Tito started his career as a Salsa Dancer by his parent's initiative, both musicians. Also he develops as a dancer of other genres such as: Jazz, Merengue, "Bomba y Plena", Rumba, Modern Dance and Tap among others. Since then, he has visited more than 100 cities worldwide giving performances and classes, with his wife and dance partner Tamara Livolsi. They both participate yearly in congresses around the world and work as judges for the Salsa Open and for the World Salsa Championships. Produce the Puerto Rico Hustle and Salsa Festival and they are part of the organization of the Puerto Rico Salsa Congress. Tamara Livolsi, was born in Argentina on February 24, 1978, but was raised in Puerto Rico; she inherited from her mother the art of dancing. With more than 20 years experience, trained in various dance disciplines like: jazz, ballet, hip hop and others, makes her a versatile dancer and instructor. She has worked for artists like: Luis Fonsi, David Bisbal, Manny Manuel, Ednita Nazario, Yuri, Grupo Mania and Wilkins among others. Both of them have participated in various television commercials, dance videos and movies such as, "Dirty Dancing: Havana Nights", Yellow, El Cantante: Hector Lavoe and American Gangster as dancers. Also they own and operate Rhythms Dance Studio, with Danny Lugo choreographer. 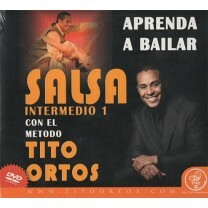 Today, Tito is not only a Salsa Dancer, he also is the Director of the San Juan City Salsa Dance Program and has made the choreographic works for concerts of artists such as: Gilberto Santa Rosa, Víctor Manuelle, El Gran Combo, Michael Stuart, Tito Nieves, Rubén Blades, Richie Rey y Bobby Cruz, Domingo Quiñones, Ismael Miranda, Elvis Crespo, Cheo Feliciano, Modesto Cepeda, Andy Montañez, NG2, Luis "Perico" Ortiz, Tommy Olivencia, Julio Voltio and Tego Calderón. He was also the choreographer for the "Bomba" and "Cha-Cha-Cha" routine in Ricky Martin's appearance in Miss Universe 2001 and the Celia Cruz "Azúcar" Special in Miami in 2003. In addition as a jazz dancer he has performed with Melina León, Yaire, Elvis Crespo, Olga Tañón and others. Ortos J. Gutiérrez Ortiz, better known as Tito Ortos, Saturce born in December 1974. After completing a Bachelor in Natural Sciences from the University of Puerto Rico and studying music, singing, bass and clarinet, Tito began his career as a dancer Salsa on the initiative of his parents, both musicians. Ortos J. Gutiérrez Ortiz, better known as Tito Ortos, Saturce born in December 1974. After completing a Bachelor in Natural Sciences from the University of Puerto Rico and studying music, singing, bass and clarinet.